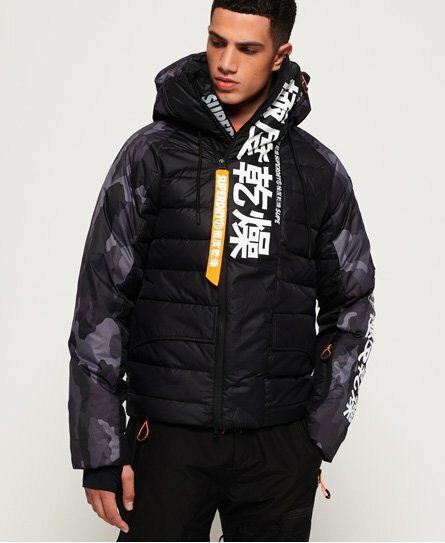 Superdry men's Japan Edition Snow Down jacket. Hit the slopes in style with the Japan Edition Snow Down jacket, it has a 90/10 premium duck down filling and a low fill power rating, making it the perfect layering piece. Outside, the jacket has double layer zip fastening, two front pockets and ski pass holder. Inside, the jacket has been designed with adjustable ski braces and also features an inside pocket and snow skirt, to help keep the snow out. The Japan Edition Snow Down jacket also features ventilation detailing under the arms, helping you to cool down as you work up a sweat on the slopes. The jacket is completed with Superdry logo detailing down the chest, sleeve and back.